This article explains more about Avere OS’s data management features, FlashMove and FlashMirror, and provides examples and details that can help you get started. As mentioned in FlashMove Overview, FlashMove copies the contents of a specified file tree from one core filer to another. If the original location was accessed through the Avere cluster, FlashMove automatically changes settings so that the Avere cluster uses the new location instead of the old location. This example details the steps involved in a typical FlashMove job. Clients access the data in nas1:/vol/acct through the global namespace path vserver1:/accounting. Before the move, the Avere cluster junction vserver1:/accounting is mapped to the core filesystem export nas1:/vol/acct. When the move job starts, Avere OS starts to physically copy nas1:/vol/acct to cloud1:/acct. Avere OS automatically creates the subdirectory acct in the cloud filesystem cloud1:/. During the data transfer, clients can continue to read and write using the vserver1:/accounting area of the Avere cluster. At the end of the data transfer, Avere OS automatically changes the mapping of the vserver1:/accounting area of the cluster - it unmaps it from nas1:/vol/acct and maps it to cloud1:/acct. This process is called transitioning. If SMB access was configured for the moved filesystem, the SMB share mapped to the junction is automatically updated so that it accesses the new destination. After the move, clients access the back-end storage cloud1:/acct through the global namespace path vserver1:/accounting. Note that FlashMove does not delete data from the move source as part of the move. The data in nas1:/vol/acct still exists, but it is no longer accessible through the Avere cluster. You can delete it using back-end filesystem tools, or re-add it to the Avere cluster with a new junction or new vserver, if desired - read Removing a Source Directory After a Move for instructions. An Avere OS FlashMove job does more than simply move files around. It also modifies the global namespace (GNS) junction to reference the new file location. Junctions define the file paths that clients use to access data from the back-end storage. Avere OS automatically updates the junction’s settings so that the same user-visible path references different storage. Users never need to know that the data has moved behind the scenes. A particular junction can be the source for only one data management job at a time (either a FlashMove or FlashMirror job). This is true even if the source of the migration is a subdirectory of the junction and for paths specified with the Custom source option. At the end of a FlashMove operation, the source junction is changed to map to the destination path. The cluster can have only one junction to a particular directory, so the destination path cannot also be a junction. No other entities should be accessing the data at the destination of a FlashMove or FlashMirror job. There is a risk of write-around (where data is changed on the back-end storage without notifying the Avere OS cache) if clients can access the destination path from a junction with another name, if clients directly mount the destination path, or if another Avere cluster writes to the destination filesystem. Write-around can cause data loss as well as a variety of problems with the data management job. Read the Junction Warning section of Creating a New FlashMove or FlashMirror Job for more information, including examples of eligible and ineligible destination directories. Also note that a filesystem being migrated must not have hard links to files outside the path being migrated. Avere OS does not detect this problem when a Data Management job is created, but it can cause filesystem problems during or after the migration. Hard links to files inside the source filesystem are safe, as are symbolic links to files inside or outside of the source. As mentioned in FlashMirror Overview, FlashMirror copies the contents of a filesystem from one core filer to another and then keeps the destination filesystem synchronized with the source filesystem as clients make changes to the source data. Clients continue to access their files in the original location, but changes are copied to an additional location. 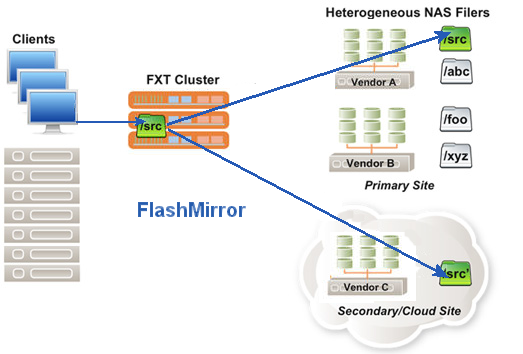 When describing a FlashMirror job, it can be helpful to think of the two data locations as the primary and secondary locations instead of the source and the destination. The primary volume (also called the source) is the location that clients access through the Avere cluster cache. The secondary volume (also called the destination) is the replica of the data, which is kept in reserve but not accessed by clients through the cluster. The next section gives a detailed example that will help you understand the FlashMirror process and the steps involved in a typical FlashMirror job. Clients access the data in nas1:/vol/eng through the global namespace junction path vserver1:/engineering. When the FlashMirror job starts, Avere OS starts to physically copy the data in nas1:/vol/eng to cloud1:/eng. Avere OS automatically creates the subdirectory eng in the cloud filesystem cloud1. Clients using the Avere cluster can continue to read and write to files in the vserver1:/engineering junction of their cluster namespace. These changes are transferred to the back-end storage nas1:/vol/eng as usual. The initial copy is called “synchronizing”. After all data is replicated to the mirror location, the mirror stays in sync by copying new changes from the cluster cache to both the primary and secondary locations. Clients still access the original namespace junction vserver1:/engineering, and their data is written to both the primary data location (nas1:/vol/eng) and to the secondary location (cloud1:/eng). The secondary filesystem is available for disaster recovery, but must not be used for routine data access. The secondary filesystem cannot be defined as a namespace junction while the mirror exists. You can change the secondary copy to the primary copy by using the mirror transition or reverse actions. Flexible (the default value) - If a new change cannot be written to the secondary data location, the system keeps a record of changes and retries the operation periodically to get the two directories back in sync. This policy minimizes the overhead of mirror synchronization work but allows the two storage systems to diverge more than the strict policy does. Strict - If a new change cannot be written to the secondary data location, the system retries immediately and indefinitely. No operation is considered complete until it has reached both the primary and secondary filesystems. This policy minimizes the difference between the two storage systems but can consume bandwidth and cache space on the Avere cluster. Additional information about these options is included in the Creating a New FlashMove or FlashMirror Job article under the Mirror Synchronization Policy option. After establishing the mirror, Avere OS continues to keep the two storage locations synchronized indefinitely by pushing client changes from the cluster cache out to both the primary and secondary storage locations. You can stop or change the mirror from the main Data Management page with the options on the Actions menu. Some of these options behave differently for FlashMirror jobs than they do for FlashMove jobs, and some can only be used on FlashMirror jobs. To use any of these controls, click the job in the table to select it, and then use the Actions drop-down to choose the appropriate action. There are several options that discontinue a FlashMirror job: Abort, Stop, and Pause. It’s important to understand the behavior of each option, and that some of them are different when used with FlashMirror than when used with FlashMove. Stop completely stops all mirroring activity. No files are added or updated in the secondary location. Stopping a job also discards the job’s state. If you restart a stopped job, all files must be rescanned and checked to determine if they need to be copied. While a job is stopped, you can change some job parameters, including overwrite mode, synchronization policy, logging, and SMB administrator username. Read Modifying a Stopped Job for details. If a mirror job is paused and a client adds a file to the directory, that file is added to the primary directory but it is not copied to the secondary directory. If a mirror job is paused and a client changes a file that has already been synchronized between the primary and secondary directories, files in both locations are updated with the new changes. A paused mirror job also retains file synchronization state. When you restart a paused job, files do not need to be rescanned to determine whether or not they need to be recopied. The Transition action can be used only with FlashMirror jobs. This action finishes copying all file changes to the secondary directory, then stops mirroring data and remaps the junction that was associated with the primary directory to point to the secondary directory. (This is similar to the end of a FlashMove job.) The original source is unmapped from the Avere cluster namespace and data in the Avere cluster cache is permanently associated with the core filer that was previously the mirror volume. You can use the Transition option to recover from a core filer failure, to decommission the original source volume, or if you need to take the source out of service for an extended maintenance period. A Transition button appears in the Actions menu. Read Data Management Actions to learn more. The Reverse action is another mirror-specific option. This action immediately swaps the secondary data location and the primary location and remaps the namespace junction to point to the volume that was the mirror. After a mirror job is reversed, data is preferentially written to the volume that was originally specified as the destination, but also written to the volume that was originally specified as the source.